Goodland is just minutes from Marco and the restaurant sits along a canal, providing a chance to see a pelican fly by. We indulged in all things seafood, beginning with our favorites, the poorly named, "Grouper Balls!" Consisting of grouper meat, eggs, and cajun spices they were deep fried and served with a cajun-spiced sauce. We continued our fried food foray with fried calamari, served with the ubiquitious marinara sauce, as well as conch fritters. Conch, a chewy shellfish, was mixed with flour and eggs creating a doughy mass. My vegetarian cousins took advantage of their housemade (skin on) french fries, sweet potato fries, fried onion rings and fried mozzarella. My brother and I changed course with bowls of conch chowder. This red soup is similar to Long Island clam chowder: a tomato base with thyme, oregano, a red pepper kick and chunks of chewy conch. It was good, though the conch was a bit overdone. The best part? The waitress, with our contented approval poured a dollop of sherry into the bowl. My cousin had a wonderful vegetarian soup: their flavorful black bean. My aunt enjoyed their cold asparagus salad while my sister-in-law tried the rich, sweet stone crabs for the first time. I loved their smoked amberjack spread, consisting of house smoked fish in a creamy sauce. For dessert, a trio of pies: chocolate peanut butter, key lime and chocolate mousse. The key lime was a more chiffon style (lightened with gelatin, perhaps) and wasn't my favorite. However, the chocolate peanut butter, as rich as a cheesecake, had us waging fork wars for the last biteful. The atmosphere was casual and relaxed and our waitress was warm and friendly. 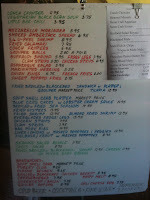 The menu (offered up on a white board), offers more sandwiches at lunch and full dishes, such as prime rib at dinner. I like your posts but the pictures are always so small. Have you ever considered posting larger pictures?